The recommended replacement is the HA7E ASCII 1-Wire Host Adapter. RS485 Multidrop with user selectable address (1 of 26). 30 1-Wire sub-networks each individually dampened. All connections are quick-connect screw connectors. Automatically adjusts for variable 1-Wire bus conditions. 1000 feet, 100 devices per CAT-5 twisted pair 1-Wire bus. Supports up to 26 1-Wire networks per host serial port. User selectable Baud rates from 1200 to 115K Baud. Pass Through RS485 and Power for easy network connection. Provides Search, Conditional search and Family search commands. Automatically generates and checks CRC16 for TMEX files. 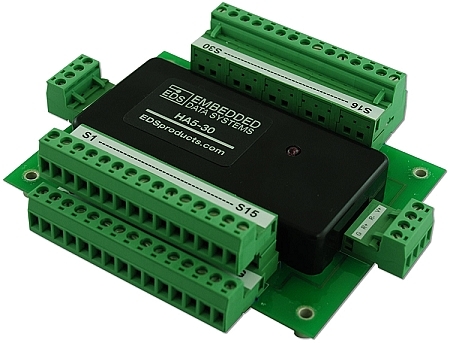 The HA5-30 is a RS485 to 1-Wire interface, which provides an ASCII command set for embedded controller and PC based applications that need to accommodate Dallas Semiconductor iButton and EDS 1-Wire sensors and controls. The HA5-30 provides 30 independently dampened 1-Wire sub-networks providing a total of up to 1000 feet of CAT-5 network cable and up to 200 1-Wire devices. This design allows an RS485 backbone of up to 4000 ft. of CAT-5 cable to connect as many as 26 HA5-30 sub-network junctions of up to 100 1-Wire devices each. This arrangement provides a workable topology for wiring large buildings. The HA5-30 relieves the host of the burden of generating the time-critical 1-Wire communication waveforms while supporting all 1-Wire devices with simple ASCII commands that can be easily generated. The HA5-30 does all the hard work of interfacing 1-Wire networks. RS485 multidrop provides as many as 26 1-Wire networks from a single host serial-port, broadcast radio or modem. 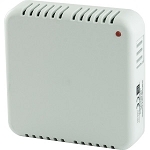 The HA5-30 can perform Search, Conditional search and Family search functions making it easy to acquire the unique 64 bit serial numbers of all connected devices. The HA5-30 constantly performs a dynamic analysis of the network and adjusts the network timing to allow for variable conditions. This results in good performance with both short and long networks with many or only a few devices attached. Many sensor devices require extra power to be delivered during periods of data conversions (DS1920 and DS1820 temperature sensors for example). The HA5-30 automatically provides the extra current these devices require with a built in smart strong-pull-up. Dallas Semiconductor iButtons which store data in TMEX Touch Memory File format can be read or written with simple ASCII commands. The HA5-30 will automatically generate and check the CRC16 error checks from Touch Memory File records. The HA5-30 supports analog, digital, and temperature 1-Wire devices and all Dallas Semiconductor iButtons.